Legendary jazz drummer and bandleader Foreststorn ‘Chico’ Hamilton, born September 21st, 1921 in Los Angeles, had a fast track musical education in a band with his schoolmates Charles Mingus, Illinois Jacquet, Ernie Royal, Dexter Gordon, Buddy Collette and Jack Kelso. Engagements with Lionel Hampton, Slim & Slam, T-Bone Walker, Lester Young, Count Basie, Duke Ellington, Charlie Barnett, Billy Eckstine, Nat King Cole, Sammy Davis Jr., Billie Holiday, Gerry Mulligan and six years with Lena Horne established this young West Coast prodigy as a jazz drummer on the rise, before striking out on his own as a bandleader in 1955. Chico appears in the March Milastaire number in the film “You'll Never Get Rich” (1941) as part of the backing group supporting Fred Astaire, and performed on the soundtrack of the Bing Crosby/Bob Hope film “Road to Bali”. Chico’s impact upon jazz includes the introduction of two unique and distinct sounds: first in 1955 with his Original Quintet which combined the sounds of his drums, the bass of Carson Smith, the guitar of Jim Hall, the cello of Fred Katz, and the flute of Buddy Collette; and the second in 1962 with his own drums, the bass of Albert Stinson, the guitar of Gabor Szabo, the tenor sax of Charles Lloyd, and the trombone of George Bohanon. Recorded first lp as leader in '55 with George Duvivier and Howard Roberts for Pacific Jazz; in '55 formed an unusual quintet in L.A. feat. cello, flute, guitar, bass and drums which acquired national following; the original personnel incl. Buddy Collette, Jim Hall, Fred Katz and Carson Smith; Hamilton continued to tour using different personnel '57-'60; group incl. Paul Horne and John Pisano feat. in the film “Sweet Smell of Success” in '57; group incl. Nate Gershman and Eric Dolphy app. in film “Jazz on a Summer’s Day” in '60; Dolphy makes first recordings with Hamilton on “With Strings Attached”, “Gongs East”, “The Three Faces of Chico”, and “That Hamilton Man”. Hamilton revamps group in '61 with new musical direction; new group incl. Charles Lloyd, Gabor Szabo, George Bohanon and Albert Stinson; group records for Columbia, Reprise and Impulse also records soundtrack for industrial film “Litho” in '62, the first American film to be shown behind the Iron Curtain. 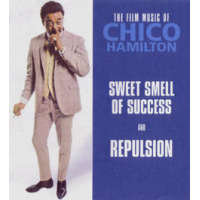 Hamilton forms commercial and film production company in '65; scores the feature films “Repulsion”, “Mr. Rico”, “By Design”, “Liebe Auf Den Ersten Blick”, “Die Sonnengottin”, and “A Practical Man”; scores for television “Portrait of Willie Mays” and the popular children's series “Gerald McBoing Boing”; scores hundreds of commercials for TV and radio. Forms new group with Larry Coryell, Richard Davis and Arnie Lawrence in '66 and records “The Dealer” for Impulse. Performs Montreux and North Sea Jazz Festivals in '72 and '73. Forms new Players group in '75 w. Arthur Blythe, Steve Turre, Barry Finnerty and Abdullah; tours with Players using different personnel '76-'80; records for Blue Note, Mercury, Nautilus and Elektra. Originating faculty member in '87 of New School University Jazz & Contemporary Music Program. Forms new group Euphoria in '87 w. Eric Person, Cary DeNigris and Reggie Washington; records “Euphoria” '87; tours Europe with Euphoria '87, '88, '90. Performs at Verona, Bolzano, Vienne, Nice, North Sea and Montreux Jazz Festivals in '89 with regrouped original quintet w. Buddy Collette, Fred Katz, John Pisano, Carson Smith; records “Reunion” for Soul Note. For Soul Note records “Arroyo” with Euphoria group, “Trio!” w. Eric Person , Cary DeNigris, Eric Dolphy tribute “My Panamanian Friend” with “Euphoria” group, and solo drum session “Dancing to a Different Drummer”. Tours Europe with Euphoria group '94. Hamilton subject of documentary film by director Julian Benedikt “Dancing to a Different Drummer” '94. 1997 Hamilton receives the New School University Jazz & Contemporary Music Program’s Beacons in Jazz Award in recognition for his significant contribution to the evolution of Jazz. Hamilton releases “Foreststorn” in 2001 featuring his new Euphoria group with stalwarts Cary DeNigris on guitar, Paul Ramsey on bass, and a new two horn front line featuring Eric Lawrence on alto and soprano saxes and Evan Schwam on tenor sax, as well as Special Guest Appearances from Former Band members Arthur Blythe, Steve Turre and his wife Akua Dixon, Eric Person, former Spin Doctors guitarist Eric Schenkman (a student of Chico's), Blues Traveler front man John Popper (also a student of Chico's), and Charlie Watts of The Rolling Stones. 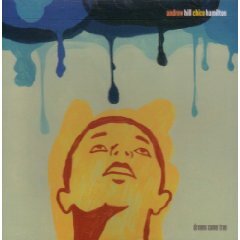 August 2001 performs in front of 2300 people at Lincoln Center My Funny Valentine- A Tribute to Chico Hamilton with Euphoria plus Special Guest Appearances from Joe Beck, Arthur Blythe, Larry Coryell, Akua Dixon, Rodney Jones and Eric Person. Fall 2002 releases “Thoughts of…” with his Euphoria group with Special Guest Appearances from guitarists and former band members Joe Beck, Larry Coryell and Rodney Jones. In 1997, Chico received the New School University Jazz & Contemporary Music Programs Beacons in Jazz Award in recognition for his significant contribution to the evolution of Jazz. In 2002, Chico was awarded the WLIU-FM Radio Lifetime Achievement Award. At the IAJE in NYC January 2004, Hamilton was awarded a NEA Jazz Master Fellowship, presented to him by Roy Haynes. In December 2006, Congress confirmed the President’s nomination of Chico to the Presidents Council on the Arts. And in 2007, Chico received a Living Legacy Jazz Award as part of The Kennedy Center Jazz in Our Time Festival, as well as receiving a Doctor of Fine Arts from The New School. Dynamic as ever at the age of 86, Chico Hamilton has a resume that includes scores for film, original compositions, commercial jingles, 50 + albums as a leader, and countless international tours. In 2006, Chico released four CD’s on Joyous Shout! in celebration of his 85th birthday: “Juniflip” featuring guest appearances from- legendary Love front- man Arthur Lee, criminally under-rated vocalist (and successful actor) Bill Henderson, and former Hamilton band members trombonist George Bohanon and bass trombonist Jimmy Cheatham; “Believe” with Special Guest appearances from vocalist and R & B Diva Fontella Bass and trombonist George Bohanon; “6th Avenue Romp” featuring Special Guest appearances from guitarist Shuggie Otis, trumpeter Jon Faddis, trombonist George Bohanon, vocalist Brenna Bavis and percussionist Jaimoe of the Allman Brothers Band; and “Heritage” with Special Guest appearances from vocalist Marya Lawrence and tromboist George Bohanon. 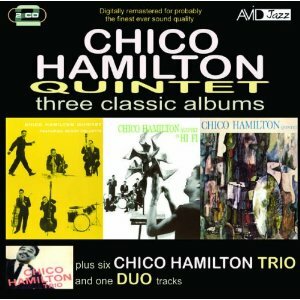 September 2007, Chico released Hamiltonia sampling his original compositions from the four albums released in 2006. Hamiltonia is an impassioned statement of purpose- an emphatic endorsement of writing and performing THIS music in the NOW, the way the GREATS did in their time, and confirms Hamilton's status as one of the most important living jazz artists and composers. Over the years, Chico has had a series of dance floor successes, including his signature song Conquistadors from his 60's Impulse album El Chico, and the Brazilian influenced song Strut from Chico's 1979 outing on Elektra Nomad, which became so successful on the Northern Soul Scene in the U.K. that it had its own dance!! Conquistadors also was the signature track for E-man when he rocked the dance floor at Frank's Cocktail Lounge in Brooklyn. In 2002 a track titled For Mods Only from Chico's 1968 Impulse album The Dealer, was included on the [Thievery Corporations Sounds from the Verve Hi-Fi. Fall 2006, Rong Music released the 12 vinyl “Kerry's Caravan” from Mudd & Chico Hamilton, a moody yet stunning slice of modern music and a molten melting pot ready made for filling the dance floor with remixes from long-term Idjut Boys collaborator and Fiasco imprint boss Ray Mang!! And the recent Impulsive! Remix Project features Mark De Clive Lowe’s take on Chico’s classic 60s track “El Toro”. Released December of 2007 from SoulFeast (Joaquin 'Joe' Claussell & Brian Michel Bacchus) on 12 Limited Edition Vinyl is their recasting of Chico's classic track Mysterious Maiden, and coming Spring 2008 from SoulFeast is a CD & double vinyl 12 EP Chico Hamilton Presents: Alternative Dimensions of El-Chico. Chico is presently teaching at New School University Jazz & Contemporary Music Program; touring extensively in North America with Euphoria group which includes Cary DeNigris on guitar, Paul Ramsey on bass, Evan Schwam on flute, tenor and soprano saxes, and Ian Young on flute, alto and baritone saxes, and Jeremy Carlstedt on percussion; recording with his Euphoria group and special guests; composing and performing music for film; and working on autobiography. 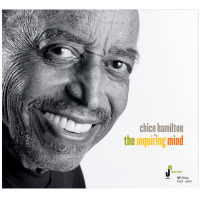 Chico Hamilton's Posthumous Album "Inquiring Mind" Available Today! All About Jazz musician pages are maintained by musicians, publicists and trusted members like you. Interested? Tell us why you would like to improve the Chico Hamilton musician page.